Hope Sports is a place for you to connect with others who enjoy an active lifestyle. We come together to enjoy sports in an open and friendly atmosphere. Hope Sports leagues and open sports are open to the community. Our desire is to provide a place for you and your family to connect and have some good, not-so-clean fun! Open basketball at Hope Church is held every Saturday morning from 8:30am-10:30am in Hope’s gymnasium. This competitive high paced full court open play is open to adults of all ages and skill level. Open volleyball is for adults of all ages and skill levels. 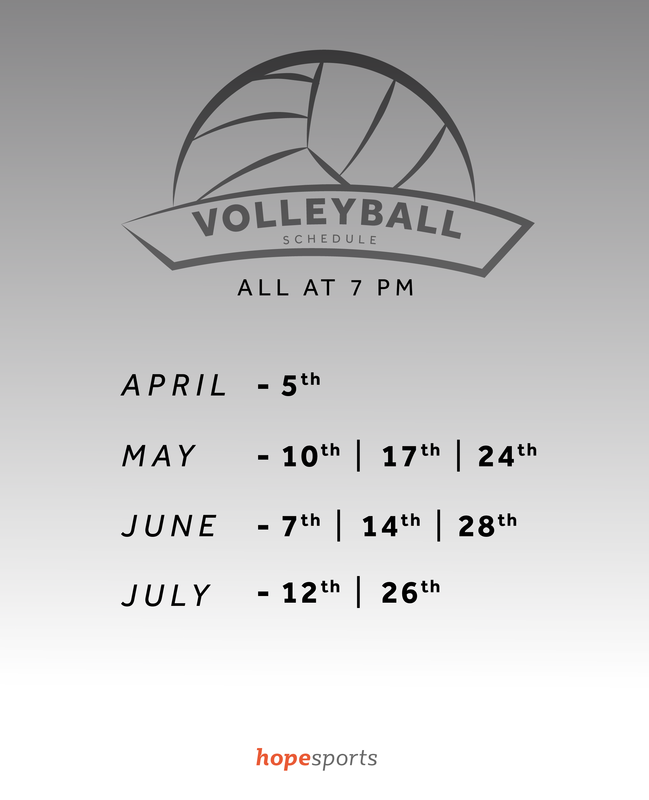 Hope’s open volleyball is held on select Friday evenings from 7pm-9pm in Hope’s gymnasium. Please check out our calendar to find out when the next open session will be held. Hope Paintball is located on the campus of Hope Church and is open by appointment 7 days a week sun up to sun down May through October. We rent everything you need to have an exciting and adrenaline filled time including mask, gun and 500 paintballs per person. Parties last 2 hours and consists of a minimum of 8 players with a maximum of 24 players. Hope Paintball recommends players are over the age of 12 to play. Cost for this unforgettable time is $35 per person, but special team and corporate pricing is available for large parties. Pickleball is one of the fastest growing sports. Pickleball is traditionally played on a badminton-sized court with special Pickleball paddles. The ball used is similar to a wiffle ball. This paddle sport is great created for all ages and skill levels. The rules are simple and the game is easy for beginners to learn, but can develop into a quick, fast-paced, competitive game for experienced players. Pickleball at Hope Church is ran by the Springfield Pickleball Club and is played during the cold months when outdoor play in unavailable.